Friends and kailyans, I’m encouraging you to go see this stage play at the Baguio City Women’s Jail. I watched it with friends on its first showing yesterday and it was fantastic. I can’t even fathom the level of creativity and imagination that went into the show. I don’t know much about theater and stage plays but I’ll tell you this: Anatomy of an Octopus Woman had me captivated from start to finish. It’s a roller-coaster of scenes involving the beautiful, the weird, the strange, and the alluring. And yes, majority of the cast of the play are inmates at the Baguio City Jail. That I think is one of the most interesting things about the show. In a different place and scenario, I would’ve just seen actors and actresses doing a great job. At the jail, however, I have to keep reminding myself that the excellent performances unfolding in front of me are coming from women who have never done theater before. I’d also like to think that the stories they’re trying to tell cut them a bit deeper given the current circumstance they’re in and the themes of the play. Maybe this attachment to the stories is among the catalysts that made the performances more honest, more urgent, more surreal, and more emotional. The play can be very emotional to the audience as well. You can fully relate to it. You can fully feel the connection. I found this a bit strange (in a good way) because there's really no concrete story around the play. I mean this in a way that it doesn't start and end like a standard story. I can only describe it this way: it's more of a cerebral and visual portrayal of an idea (or ideas). And serving as a subtle backdrop for the play are the individual stories of the performers. This makes the play as real as it gets. You are literally watching incarcerated women bare their souls and their dreams just a few feet away from you. This is how art becomes real. I can go on and on but there's nothing I can say here that can justify the surreal experience of watching Anatomy of an Octopus Woman. You have to see it and decide for yourself. 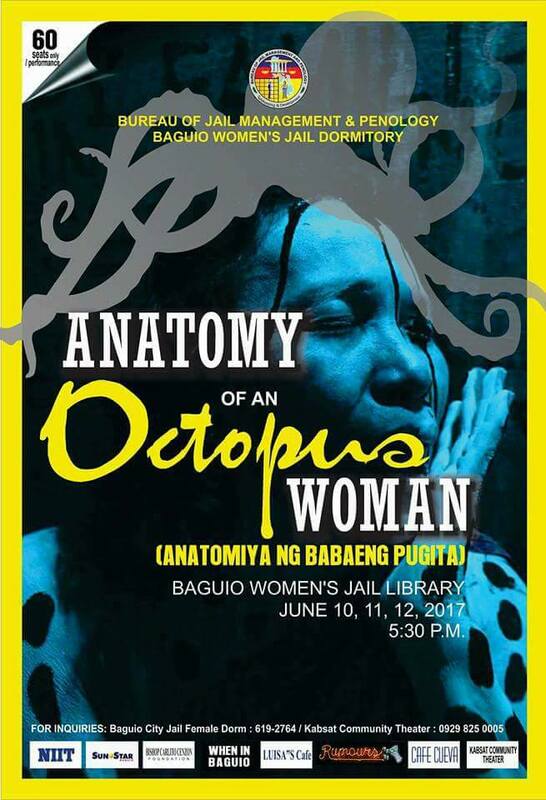 You can still catch it on June 11 and 12 at 5:30 PM at the Baguio City Women's Jail. Tickets are priced at Php200 (regular) and Php150 (students, senior citizens, persons with disabilities).